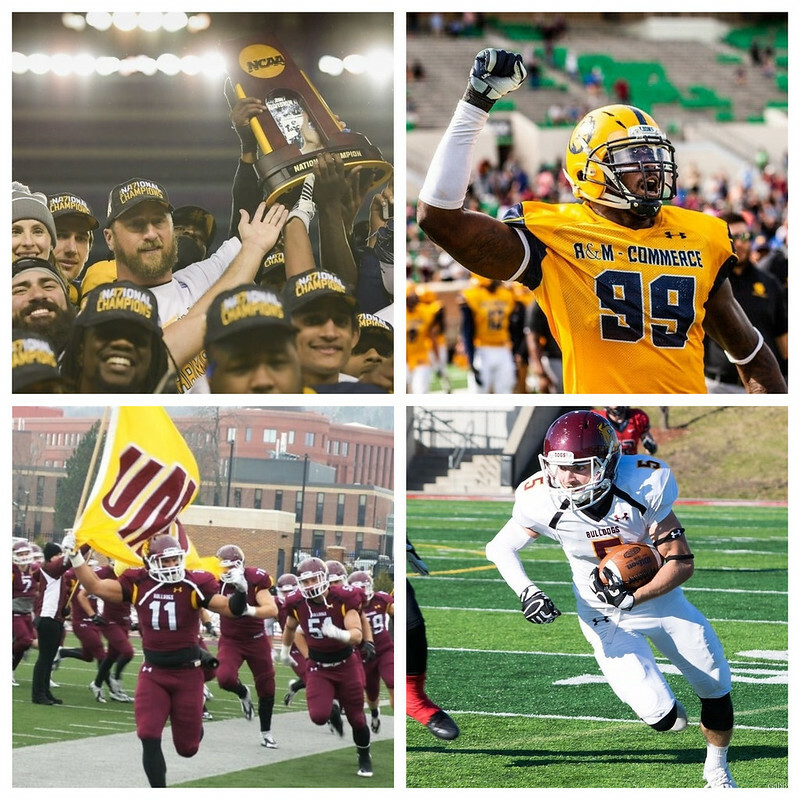 TAMUC travels to Duluth as defending National Champions facing a Bulldog program that’s won the natty twice in the last 10 years themselves. That makes this is one of the most interesting first round contests. Commerce doesn’t have 2017 Harlon Hill award winner QB Luis Perez and a 500 yards passing per game offense. Not to dismiss the Lions, but their makeup this season is a little different. Like UMD, Commerce had a change at quarterback midseason and since then Kane Wilson (JR) has done a decent job leading the squad to a 6-1 record, including a win over rival Midwestern State. Wilson isn’t throwing for the type of eye-popping yards Perez did a year ago, but he’s a capable, bigger quarterback who can move the chains or score on the ground. He’s been aided by the emergence of RB Ovie Urevbu (SR) who’s rushed for an average of 150 yards per game the last 3 weeks. 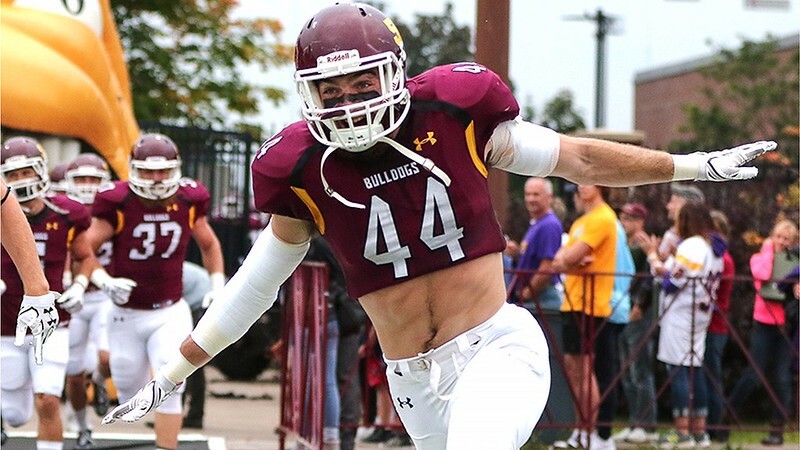 UMD can expect to see a lot of the wideout screen game Commerce is known for along with players faster and more athletic than what the Bulldogs see weekly in the NSIC. Vincent Hobbs (#15, TE/WR, SR) has been impacted by injury this season but was a key playmaker a year ago for the Lions. Hobbs’ good hands and 6’2 and 255lb frame make him a handful once he’s caught the ball. Hobbs played as a true freshman at Colorado and is a player UMD will need to account for when the Lions need to make a play in the passing game. The Lions 4-3 defense is one of the Lone Star Conference’s top units, allowing 19ppg and 298ypg. The Lions permit 120ypg on the ground and 178ypg in the air, with opposition passers completing just 52% of their throws. Linebacker Brucks Saathoff (SR) has been a strong stopper the last few seasons along with lanky and athletic Defensive End Michael Onuoha (SR). Onuoha started his collegiate career as an Oklahoma Sooner and saw time on the field as a true freshman. After an injury, Onuoha eventually found himself at Commerce and is now a top player on the D2 NFL prospects list. TAMUC is fast in the back half and while the Lions only have 9 picks, they’ve taken 4 of them to the house. Quarterback John Larson (SO) was the best in the NSIC the first half of the season, mixing both run and pass in leading one of the top offenses in the leauge. Larson and 2017 1,000-yard receiver Jason Balts (SR) both went down with season ending injuries around the same time. For most teams this would derail an undefeated season and cripple their attack. Not UMD. The Dogs have continued to power ahead with Mike Rybarczyk (JR) under center. Rybarczyk was the UMD starter to open 2017 season before suffering a season ending injury a few games in. Larson won the QB battle this fall but the Dogs coaching staff felt very good about their QB depth. Since assuming the reins, Rybarczyk has been ok in the passing game. His impact has been seen on the ground, as he’s averaging 80 yards rushing as the full time starter. Redshirt Freshman Wade Sullivan, a former Mr. Football in the state of Minnesota, landed at UMD thanks to being undersized for the D1 level (5’8 and 165lbs). The smallish Sullivan is a quick back who can also make plays as a receiver. Sullivan adds about 80ypg of offense. Together Rybarczyk and Sullivan offer UMD a nice 1-2 punch on the ground. Wideout Nate Ricci (SR) is the swiss army knife of the Duluth attack. He’s a wideout who can stretch the field, run the ball when called upon as well as someone who can throw on gadget plays (played QB for UMD years ago in spot duty). The UMD defense has drawn most of the attention the squad has garnered nationally. It leads D2 in yards allowed per game (199) and is 3rd in points allowed at 10.5 per contest. The Dogs D is led by star Gus Wedig (SR), a 6’4 and 215lb backer who plays full-speed from sideline to sideline with hitting in mind. Wedig finished the year with 45 tackles, 3 forced fumbles, and 8.5 tackles for loss. Wedig is flanked by fellow backer Alex Helmer (SR) who lead the team in sacks with 10, along with Nate Pearson (SR) with 6.5 sacks. Nose Tackle Dre Greer (SR) is also a handful in the middle and is the anchor of this Dogs Defense. Safety Sam Lynch (SR) spearheads the back half of the UMD defense, along with cornerback Tareq Abulebbeh (SR), a transfer from Southern Illinois University, who netted 5 interceptions in just 7 games (injury). The unit as a whole has limited opposing quarterbacks to a 42% completion rate while finishing tops in D2 against the rush, allowing 59 ypg. The UMD defensive stats are truly amazing. While some of it can be attributed to playing a weak NSIC North schedule with three extremely challenged offenses (Minot-Crookston-Mary), the Dogs D did hold the top teams they saw Bemidji State (7-4) and Winona State (8-3), to 295 and 193 yards respectively. Has the UMD defense seen a playoff caliber offense yet? No but they’ve looked strong against the best their schedule had to offer and even if they don’t replicate their regular season dominance, they should still be very stingy against any opponent. TAMUC visits Duluth having won twice last year in the playoffs on the road in Minnesota, at Winona and Mankato. The 2017 championship run the Lions went on through Minnesota should give them supreme confidence vs. the Bulldogs. 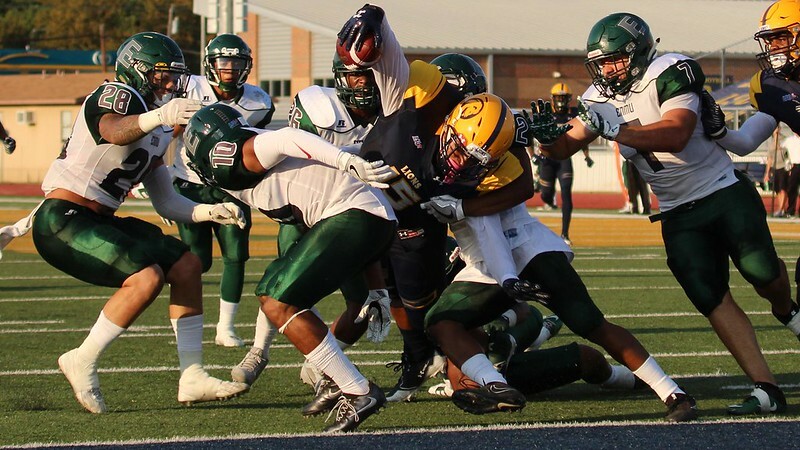 What has separated Commerce from other LSC playoff teams of the past is a strong defense to go with a dangerous offense. A good defense will travel come playoff time. A challenge the Lions might experience is their wins in Minnesota last year were in 30 degree weather. That wasn’t terribly threatening for a Texas squad. Duluth is a slightly different beast when it comes to the frozen tundra. Expect temperatures this time around to be in the high teens with wind. Saturday will play a fair amount colder than the games TAMUC experienced a year ago. The Lions are -8 in turnover margin, due to fumbling the ball 25 times in 2018, losing 14. By comparison UMD is +5 in turnovers. With the players likely freezing their tails off on Saturday, Duluth’s ability to be more careful with the football is an important factor. When digging into this game it looks like Commerce is re-loading a bit from its record breaking offense of a year ago, along with a playing a quarterback that’s not nearly as experienced or accomplished as Luis Perez. UMD is also going through a similar situation at QB but the Bulldogs return 4 starting offensive linemen and more than 20 Seniors, including key playmaker Nate Ricci. I’m expecting UMD to limit the TAMUC running game and then try and pressure the quarterback. If UMD gets to the passer, it wins this game and maybe even going away. IF they don’t get pressure, Commerce is especially dangerous in-space. IF UMD isn’t sure tackling on the screens or if it gets caught in man coverage, it’ll be a long afternoon for the home team. On the flipside, the Commerce D will also limit the Dogs offense, as TAMUC is quick to the spot and in the top 5 in D2 at tackles for loss. I expect the Lions to key on the UMD rushing game and try and make the Bulldogs take to the air. Given how well UMD mixes the run and the pass, along with having to account for the quarterback in the running game, will make slowing down the Duluth rushing game especially challenging. The Bulldogs average 36 minutes with the ball per contest, good for 2nd best in the nation in time of possession. One area where Commerce has a clear advantage is in the kicking game. TAMUC kicker Kristov Martinez (SR) is an All-American who’s long is 52 yards this year. He also made numerous big field goals down the stretch for the Lions a year ago. UMD has been splitting time between two kickers and not having a lot of success with either, finishing the year 7 of 16 on field goal attempts. At times UMD even goes for 2 instead of trying a point-after-attempt. If this game comes down to the need for making field goals, the Lions have an immense advantage. There’s so many small things that make this matchup interesting. Can the Lions continue to win on the road in the playoffs for a 2nd straight year? Can the top-rated UMD defense shut down a squad like Commerce? I think the answers will lie in the turnover game. I also believe the weather favors UMD. The Bulldogs style of football is more conducive to the conditions that’ll be seen come Saturday afternoon in Duluth. After watching both teams over the last week, I like Tarleton to handle APU in a one-sided contest. APU made the playoffs based off their road win a week ago against Central Washington, 42-35. However, Tarleton is better defensively than the teams Azusa has come across this year, along with having one of the top offenses in D2. Mines beat Pueblo during the regular season 35-21 despite being outgained 435 to 267. Pueblo has a defense that rivals UMD and the Thunderwolves have finished the season much stronger than the Orediggers.